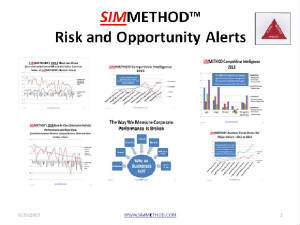 SIMMETHOD: A new way to measure and predict corporate risk and performance and fend-off current and future competitors. SIMMETHOD's new store is powered by FastSpring where you can subscribe to the Strategy and Execution Performance Predictive Index, Best-In-Class profiles and C-Level risk and opportunities alerts. SIMMETHODTM Performance Predictive Algorithms, Strategy/Execution Performance Predictive Indices, Competitive Intelligence Database and Leading indicators identify and rate the Best-In-Class companies and management teams via Industry Agnostic Indices and enable you to create new value-chain leading indicators to predict new threats and opportunities coming from inside and outside your industry. Unlike other solutions, SIMMETHODTM extends your line of vision to the value-chain in order to identify, learn and adapt the Best Practices of the Best-In-Class and identify previously undetected strengths, weaknesses, threats and opportunities in relation to current and future competitors. SIMMETHODTM converts data into ratios and ratios into performance predictive industry-agnostic indices in order to enable meaningful comparisons across industries and value-chains and avoid confusing any positive trend for real competitive advantage. In fact, through the analysis of 1000's of business and management metrics SIMMETHODTM has identified a strong correlation between management's ability to strategize and execute against their peers including current and future competiors and their long term growth and value creation. SIMMETHOD™ is a relative scale that measures and predicts Business risk and performance and rates management's ability to strategize and execute against a constantly changing set of Business, Industry and Market risk and performance metrics. It is like a sport league table constantly searching for the top teams across a range of of industries in order to find their Best-In-Class strategy, Execution, Business Models, HR practices, processes, metrics and profiles.